09/10/2012 9:00 AM - Every year Iowans flock to Boone, celebrating the town's railroad heritage and contributions to the Union Pacific Railroad empire. 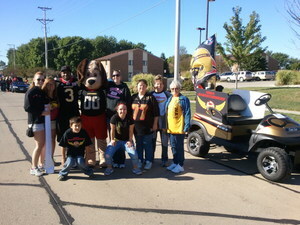 On Saturday, September 7, 2012, members of the Iowa Barnstormers team and front office, along with some enthusiastic fans, all joined together to represent the organization in Boone's 36th annual festival parade, Pufferbilly Days. The group marched along the two-mile route where hundreds of people gathered and lined the streets in excitement. The Iowa Barnstormers organization would like to thank everyone who participated in the parade, extending a special thanks to season ticket holder Ron Miller for his organization and coordination of the event. If you have ever been to a Barnstormers game, you might recognize Ron as one of our crazy fans in the front row who proudly wears his #77 jersey. The Iowa Barnstormers will be participating in Beaverdale's Fall Festival Parade this weekend, taking place on Beaver Avenue, between Hickman Road and Douglas Avenue. The parade begins at 10am for all those interested in coming out and showing your support!